It’s flashy, daring, it’s unexpected. The Illusionists live from Broadway combines five of the world’s top illusionists, each a specialist in their own area, as they join forces for this massive production. Colin Cloud brings his mind-reading prowess, Jonathan Goodwin is a daredevil who isn’t afraid of anything, An Ha Lim is the top manipulator in the world, Darcy Oake performs grand illusions such as disappearances and levitation, and Adam Trent is The Futurist specializing in creative, interactive magic. What really sells this show is the production value. No expense has been spared with large led video screens, backup dancers, and the best in props and special effects. Many of the acts that these illusionists perform are not new or revolutionary, but, as with so many things, it’s not what they’re doing but how they pull it off that matters. 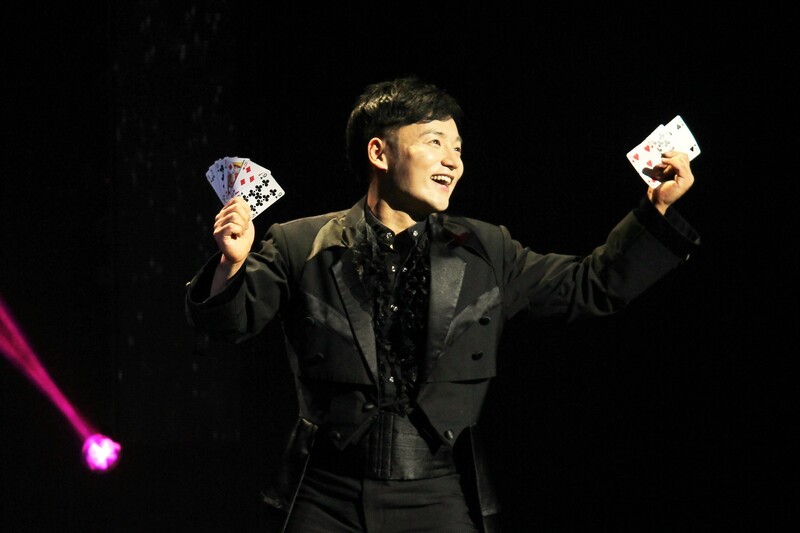 For example, An Ha Lim, a master manipulator from South Korea, has a feature act that involves him seeming to make cards appear out of thin air as he suddenly has a bunch in his hands, fans them out, lets them fall and then magically has more in his hand. This is not a new trick, but Lim’s execution is flawless, his artistry like a dance. I wished he had more stage time, but he was only on once more at the very end when he performed another flawless card trick, this time on a flat table with cards that shape-shifted, disappeared, and re-appeared. There was quite a bit of audience participation throughout. Trent took one audience member’s iPhone and put it in a blender (no iPhones were harmed in the end), Cloud read the minds of a couple of people both onstage and off, and Goodwin had an audience member slap him in the cheek while he had a scorpion in his mouth and tried to break free from a pair of handcuffs. Of course, the best illusions are those that leave you without any idea how they have been done. There were a few of those, but there were also some rather common ones that are easily explained. It’s not always necessary to have no idea how a trick is done, but in that case it better be so well done that knowing becomes irrelevant. Goodwin probably got the most gasps from the audience as he performed his daring acts such as trying to escape from a straight jacket while hanging upside down and trying to beat a timer connected to a saw that would release him to fall into a bear trap. It’s an elaborate setup that surely is very safe in the end, but it sure does look menacing and Goodwin manages to leave his escape to the very last second to maximize the suspense. All five of these illusionists are pure entertainers, and that’s the most important thing. Yes, they can perform their acts well, but they also hold the audience’s rapt attention and compel us to believe that things aren’t what they seem; that seeing isn’t always believing.